"We used them to move, they where friendly, fast and did a great job. They packed one day and came back the next to move..." - Eshelle M.
I'm extremely pleased with the service I got from Ken/Stateside Movers. He helped me move my elderly parents from WA to NV on short notice and during the winter with the snow and rain. The communication with Ken was excellent; him and his crew are friendly and professional. Ken's prices are very fair and his crew had my folks house packed up on a Thursday and were in Nevada later the next day. I was amazed! I highly recommend hiring Stateside Movers!! "Hi Ken, you are the best! Thank you a thousand times for your great help! I am loving my new home! Does and fawns were here last night, munching on the golf course so I am home now!! My review goes as follows ...Hey all you movers out there. If you want to have some fun with very professional movers then go with Stateside Movers! I went from Sandpoint, Idaho to Oregon and all went very well. The loading went fast and efficient and the unloading the same. Ken and his crew are very detail oriented especially with ANTIQUES. Thanks guys - you did a great job for me." Not sure if we're the right moving company? 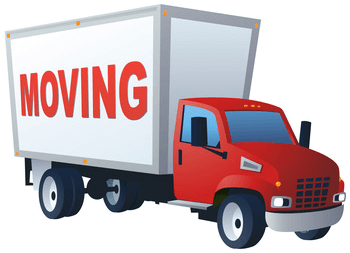 Though we are a new moving company started in early 2018, the owner and staff have over two decades of experience in multiple aspects of moving, and it shows. Just check out our Google reviews so far this year for Stateside Movers LLC (our interstate operations) and Lake Coeur d'Alene Movers (our local operations). So what kind of Coeur d'Alene moving company reviews have we been getting from our customers? Several have taken the time to post five star reviews on both Google Maps and Yelp. Here's just a few of several testimonials we've received. "Stateside moved us from a 4000 square-foot home to a 2000 square-foot home and did a terrific job. They were courteous, professional and helped us with anything we asked them to do, at a reasonable price. I strongly recommend you consider stateside for any size move. Their service is a great value!" "Ken and team had the daunting task of moving a household that had been in place for over 27 years. They were patient about dealing with loose items and took extra care to ensure a secure load for traveling over a very bumpy mountain road. Thanks for taking such good care of our belongings!!" "Great experience! They moved a very heavy and awkward item up a difficult flight of stairs for me. They paid great attention to detail of protecting the item, walls, and trim. Highly recommend!" "The movers where great. Fast and felt with my husband always wanting to help so well. Definitely worth every penny"
"Great response to needing a safe moved in a short timeframe. Pricing was reasonably and they were there when needed. I would recommend to anyone having a need for assistance with a move." "So far we are really happy with Ken. He has helped us by being very flexible and helping us problem solve before we have even moved! I’ll be back when the move is over to finish my review, but so far outstanding service!" I discovered Ken Wilson of Stateside Movers LLC by doing a simple Google search for CDA Moving Companies. Specifically I was needing help packing up our house, and was thrilled he was able to come to our house the very next day. I have to say, I was impressed with his level of professionalism, knowledge, consistent courtesy, punctuality, positive attitude, work ethic, etc...he even brought his own lunch. It was/is very clear to me that he genuinely cares about providing his clients with the best possible Customer Service experience possible; he’s a very conscientious individual who will expect his employees to provide the same level of service as his business grows. He is coming back tomorrow to continue helping us, and I know my husband will be equally impressed. Hire Ken for your moving needs, you will not be disappointed"
"I was searching online for a moving company when I called Ken with Stateside Movers. I knew after I spoke with him I be using him for my moving needs. I was impressed with how knowledgeable and confident he was with being able to complete my moving job. I had a two bedroom apartment I needed packed into a POD. They arrived on time, friendly, and worked hard to get the job completed in a timely manner. I would recommend them to anyone who has moving needs. Great job!" "Have a antique piano i was trying to give away before we moved. couldn't get it picked up so had to move to storage. Ken fit me in last minute and gave me a good deal. they were careful and conscientious. awesome." "These guys saved the day! My mom desperately needed LAST-MINUTE help with packing and moving on VERY short notice. I thought there was no way a company would be able to squeeze us in, and not only did Ken and his miracle workers fit us in, pricing was totally fair and kept us on budget. I am so grateful and would recommend their services to everyone!" "The crew was punctual, hard working and efficient. I’ll be calling them to unload when I’m ready." "Great communication, strong backs, helped me move my 10×15 storage shed quickly, enjoyed working with Ken, on the ball when answering the phone and on time, thanks for the help, saved me money." "Great people, very friendly and really know what they are doing. They handled my antique furniture without a scratch and were the best price around." Welcome to LakeCoeurdAleneMovers.com. 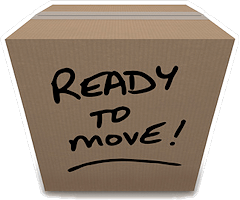 Our site is packed with information and moving tips on Coeur d'Alene, Post Falls, Sandpoint, and North Idaho moving. 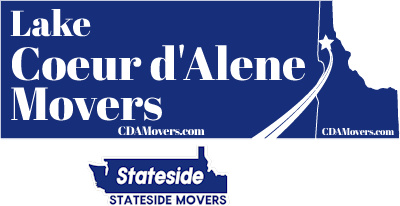 See: Coeur d'Alene Professional Moving and Coeur d'Alene Packing / Unpacking Services. We value great talent, and what we look for are a positive attitude, that you are clean cut and with good character references, and then we hand train you to be a part of the Lake Coeur d'Alene Movers / Stateside Movers LLC team. See: Coeur d'Alene Moving Jobs.